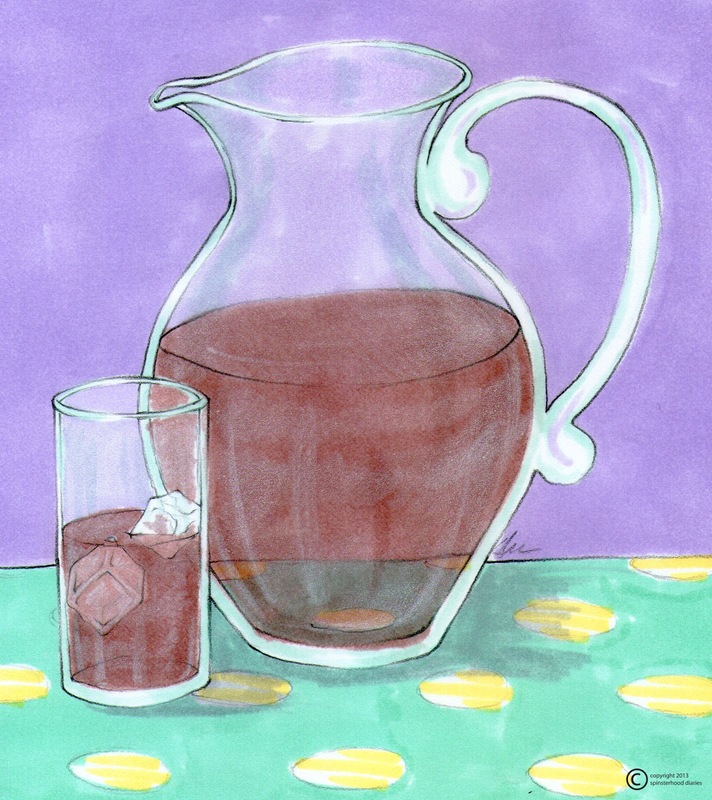 You don't have to be as spinster to love some sweet tea. You don't have to be from the south, either. But since I'm up north, I have to brew my own. So, today we're taking a break from all this fashion talk to have some recipe time. This is so easy, you'll start bringing it as your party drink. I bring it to parties all the time since I'm a nondrinker, but apparently it's a great mixer, too. I know the photo here is of a glass pitcher, but most people in the south use a (most of the time blue) plastic pitcher with a lid that fits easily on the refrigerator door. If you're taking it to a party, though, You should brew it in the pitcher and then pour it into an empty water jug you get from the store. This way you can just leave the tea there. Because, let's be honest. It's pretty heavy. 1. Boil about 1/3 gallon of water on the stove. Just make sure there's enough water so the sugar will dissolve easily. 2. While you're waiting for the water to boil, pour the 1 1/2 cups sugar into your plastic gallon pitcher. 3. Once the water boils, pour it over the sugar and then stir it until all the sugar is dissolved. 4. Put the tea bags in the sugar water and make sure they're submerged. Put the lid on the pitcher and wait for five to ten minutes or until the mixture is about the color of weak coffee. You want it to look like it'd be a bitter cup of tea. 5. Once the tea is dark enough, remove the teabags, throw them away, and fill the rest of the pitcher with water and stir. 6. Leave the tea out until it's cooled a little and then refridgerate. 7. Serve Iced with or without lemon. Now, don't go overboard with this once you realize you love it. I'm petty sure this is how Paula Dean got diabetes. But sometimes I like to drink it in the morning. And of course at lunch and/or dinner. And all the time. Heaven help me.